NEW Versatile Communications - Compatible with SNMPv1, v2C, and v3 protocols. Multiple server shutdown - The SNMP management software included provides an automatic shutdown of servers through a schedule pre-programmed by an administrator or when critical power events occur. The SNMP-NV6 card is designed for management and control of a UPS on a LAN. It is compatible with the EnterprisePlus, Endeavor, and PRO-RT Series. 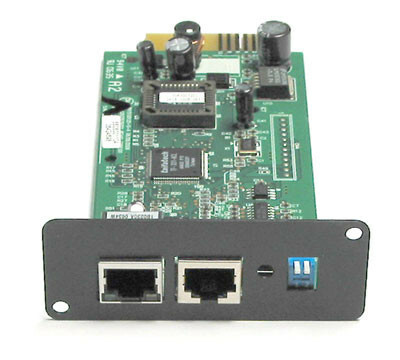 The SNMP-NV6 card is an interface between the UPS and the network. It can obtain the information from a UPS and issue commands to it. SNMP-NV6 card supports two kinds of protocols – SNMP and HTTP for user access. Through the SNMP NMS and Web Browser, the user can setup the SNMP-NV6 card obtain information from the UPS and issue commands to UPS.